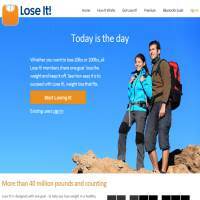 LoseIt.com is a high tech solution to weight loss. Whilst it doesn’t provide a great deal of advice on healthy eating and recipes, or on particular workouts to try, its various tools and apps help you to accurately track your eating and exercise activities to determine methods to improve. This service is available in three forms: Basic, Premium or Premium plus Bluetooth scales. The basic membership is free and allows you to see what’s on offer, though many features are restricted. Upgrading your account to Premium opens up these additional features for a year, and paying an additional fee provides you with a Bluetooth scale device which is compatible with iPhone 4S and iPhone 5, iPad Mini, iPod Touch (5th generation) and iPad (3rd and 4th generation). The measurements available are more sophisticated than you’ll find on many sites, and include blood sugars, nutrients, blood pressure, body measurements and more. If you take the time to track these accurately, you’ll be able to see how your exercise and food consumption impacts on your vital statistics at particular times. This is really useful if, for example, you realise that you eat more sugary foods at night but tend to do worse in your exercises afterwards. From this, you might decide to cut down on sugary snacks in the evenings or to try to push harder when working out at night. You can compare and contrast statistics using the mobile apps or from your regular dashboard, viewing graphs and tables to help illustrate patterns. This can also tie into your goals, which you decide ahead of schedule. If you reach your goals, the system rewards you with badges to help keep you motivated. There’s an active online community on Lose It, and you can produce a profile page, find friends or invite members to become friends. You can also chat in public or private chat rooms, sharing thoughts, ideas, recipes and more. The forums are used regularly and are a good place to meet new friends. As we briefly mentioned, this site isn’t great if you’re looking for a lot of exercises and recipes to try out. In fact, you’ll probably want to go elsewhere for those particular features. However, when it comes to measuring and monitoring, there’s plenty to like here. If you’re keen to learn about fitness or other topics important to weight loss, the forums may offer a good learning opportunity. Before paying for Premium membership, we’d recommend taking a look around the site and working out if it has everything you’re looking for. You can open a free basic account, which gives a decent glimpse into what’s on offer, or contact the team if you have more questions. There’s evidence to suggest that dieters who use tracking and monitoring software to keep a check on their eating, exercise and weight loss, are more likely to succeed, and keep the weight off. If this is true then LoseIt could be an invaluable tool in the journey towards reaching your ideal weight. With a range of user-friendly apps, and a strong sense of community, you ought to be on the road to success soon enough.